Arigato's - 2995 Bethesda Pl Winston Salem NC 27103 (336) 765-7792 Authentic Japanese Steakhouse & Restaurant food prepared in front of you Reservations Suggested & sometimes Required. River Birch Lodge - Open 7 Days a Week -- 3324 Robinhood Road Winston Salem, NC 27106; large selection shrimp, salmon, chicken, trout, pork tenderloin, pasta, lasagna, vegetable platter, spinach and wild mushroom rolls, quesadilla, nachos, wings, pine nut shrimps, steak mignon, salmon wrap, homemade pizza's, wine, desserts. Hours: Monday thru Thursday 11 a.m. - 10:00 p.m.; Friday & Saturday 11 a.m. - 11 p.m.; Sunday 12 noon to 10:00 p.m.
Tlaquepaque, 511 E 52 Bypass Pilot Mountain, NC 27041 (336)368-1900; Mexican food - Really Good. Soppers - located on Main Street downtown Pilot Mountain (336) 368-2325; open open Tues - Saturday from 11am till 9pm; Serves Greek, American, Homecooking & Italian "Great Food!" The Main Oak Emporium, (336) 789-2404; Home of The Official Andy Griffith Collection - Enjoy a cup of Coffee, Specialty drinks, Smoothies & Lunch Live Entertainment on Thursdays & Weekends at the Good Life Cafe ~~ furniture, antiques, art, home accents, garden items, wine & gourmet foods, Good Life outfitters & much more collectibles. Leons Burgers for the best cheeseburger you will ever eat on Main Street. King is about 10 minutes from us & they also have some other places to eat that are not listed. (336) 366-3590 - Open Mon - Wed from 10-6pm; Thurs - Sat to 10am - 9pm; Sundays from 11am - 6pm. Barn Dinner Theater (336) 292-2211 or (800) 668-1764 - Located at 120 Stage Coach Trail, Greensboro, NC 27409.
about 40 minutes from Pilot Knob Inn. Downtown Galax is an incredible shopping experience too so you can make a day of it. www.thegalaxsmokehouse.com (276) 236-1000 & right across the street if you love bluegrass music visit www.rextheatergalax.com for Old Tyme Music Or Macado's www.macados.net Award winning dining since 1978. 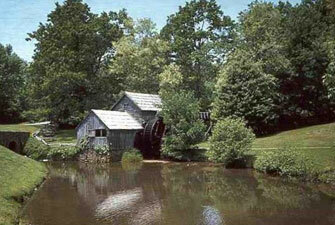 Mabry Mill is located in Meadows of Dan, Va. at Milepost 176 on the Blue Ridge Parkway. It is open seven days a week from 8 a.m. to 6 p.m. from the last weekend in April throughout October. Demonstrations that may include sorghum molasses making, apple butter making, grinding corn and buck wheat take place every Sunday from 2-5 p.m. The mill emphasizes the pioneer culture of the Blue Ridge Highlands and impromptu music and dancing are usually a part of Sunday afternoon activities. Free admission. Food and drinks are available at the restaurant on the premises. For more information, contact 276-952-2947. The Rockford Preservation Society Inc. was organized in 1972 to stabilize and preserve the town of Rockford. 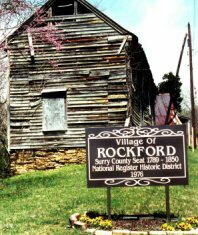 The town of Rockford was established by a legislative act in 1789 and served as the county seat of Surry County until 1853. At that time, Surry County encompassed present day Yadkin County. The town bustled with hotels, taverns, mills and general stores. As the county seat, Rockford became a commercial center, as well as, the hub of county and private business transactions. The town of Rockford was placed on the National Register of Historic places in 1976; the Rockford Preservation Society was incorporated the same year. Today, Rockford represents a part of Surry County's unique history and has become quite a tourist attraction. Visitors to Rockford can also enjoy looking at the antiques, candy and odds-and-ends that fill the Rockford General Store. Operating Hours: Closed Monday and Tuesday; open Wednesday-Saturday, 10 a.m.-5 p.m.; and open Sunday, 1-5 p.m. For more information, call 336-374-5317. Hacker House 336 - 351 - DARK on Hacker House Trail, Pilot Mountain, NC search for Hacker Houe on facebook and you tube. Pilot Mountain State Park - Also known as "Mount Pilot" from the Mayberry Show. This park is within walking distance from our B&B. Hanging Rock State Park -Waterfalls, boating, picnicing, fishing, rock climbing, repelling, hiking, horseback riding & swimming in the 12 acre lake. (15 mile drive) Call (336) 593-8480. Stone Mountain State Park - 600 foot granite dome; more than 17 miles of designated trout waters. Hiking, fly fishing, picnicking, rock climbing, repelling & horseback riding. ( about a 35 mile drive) 8AM - 5PM. Call (336) 957-8185. Tanglewood Park - Clemmons, NC. Full park including horseback riding. Open daily 7 AM - Dusk year round. Admission. Call (336)766-9540. Tuesday - Saturday 10:00 a.m.- 4:00 p.m.
Horne Creek Living Historical Farm - Pinnacle, NC. (336) 325-2298. Admission is Free. Reconstruct the physical enviroment and seasonal work cycle of a North Carolina family farm. Tri-State Angler Guide Service - Our guides specialize in fly fishing float and wade trips for trout and smallmouth bass. High Point International Horne Furniture Center - Come to Highpoint; The home of the largest Home Furniture Show in the world. Korner's Folly- The strangest house in the world. (336) 996-7922. Hanging Rock Outdoor Center (336) 593-8283. Mabry Mill - The Blue Ridge Parkway's most photographed location. (276) 952-2947. Reynolda House Museum of American Art - (336) 725-5325. Wally's Service Station - Offering Squad Car Tours. Located at 625 S Main Street in Mt Airy. Hours: Monday - Friday 9AM - 5PM and Saturday 10AM - 3PM. (336) 719-0181 or 789-OPIE. Hot Air Ballooning with Avian Adventures - (336) 699-3332. Yadkin Valley Wine Trail Visit this website for all of the vineyards in the Yadkin Valley. Includes maps and schedules of special events, including concerts & wine festivals. HUTTON VINEYARDS - (336) 374-2621 located less than 1 mile from Historic Rockford. Come visit the Yadkin Valley's newest winery & super close to Pilot Knob Inn! Saturday Morning Jam Session - Join the jammers on the stage of the Surry Arts Council's Historic downtown cinema, 142 N Main Street, Mt Airy for 90 minuites of music by some of our area's pickers every Saturday morning at 9am until 10:30am. Blue Ridge Jamboree - (Third Saturday Monthly) Admission $7.00; Contact the Surry Arts Council. Thursday night jam session - Andy Griffith Playhouse, 218 Rockford Street, Mt Airy. Contact the Surry Arts Council. In-room Massages available; Call Diane Blakemore at (336) 345-0328. Call Penni Miller at (336) 971-1542. The Main Oak Emporium, (336) 789-2404; Home of The Official Andy Griffith Collection - Enjoy a cup of Cofee, Specialty drinks, Smoothies & Lunch Live Entertainment on Thursdays & Weekends at the Good Life Cafe ~~ furniture, antiques, art, home accents, garden items, wine & gourmet foods, Good Life outfitters & much more collectibles. Bregman's Trail Riding (within 2 Miles from our Inn) (336)368-5740 "People Friendly Horses"
Ogburn Stables - 15 min from Pilot Knob Inn - (336)983-2279. Tanglewood - 40 min from Pilot Knob (336)766-9540. Mount Airy Museum of Regional History (336) 786-4478 Tues-Fri 10am - 4pm Sat from 10am - 4pm Small admission fee. SMALL ELOPEMENT WEDDINGS ON THE PROPERTY OR AT THE MOUNTAIN are available. If you would like a preacher to meet you somewhere with your own special arrangements please contact Bruce Hodges at (336)648-5823 leave a message with Bruce. Carolina Ziplines Canopy Tour 336 972-7656 - Harness & ride thru the forest canopy on over 4,000 feet of steel cable. Be sure to mention you found them from Pilot Knob Inn & they will give you a 10% discount. www.prohealthcenter.com - Northwest Medical Partners / PROHEALTH Center is $5.00 for a daily pass. You can use their indoor walking track, indoor lap pool, outdoor swimming pool, spa hottub, all nautilus equip stair master, free weights bikes & much more This is a 15 minute drive straight up Hwy 52N in Mt Airy, NC. www.homplacepark.com - Swimming & miniature golf.. 15 minutes from Pilot Knob Inn. Colonial Mayberry Mall - 80A-3 Colonial Mayberry Mall Mount Airy NC 27030 (336) 786-1005 which has 25 stores including belk, bath & body works, jc penny's and is within 15 minutes of a drive from Pilot Knob Inn. Hanes Mall - 3320 Silas Creek Parkway #264 Winston Salem NC 27103 (336) 765-8321; 203 stores For all your shopping needs, approx 20-25 minutes from Pilot Knob Inn. Back to the Basics Wagon Rides (Mount Airy)- approximately 1 mile long, downtown historic Main Street to our lit Christmas Tree in back; pick up point, old City Jail; Hours: Fridays - 5;30 until; Saturdays - 5:30 until; Sundays - 2:00 until; $5 per person; Call (336)755-7385.